As you can see, the plate comes with a blue plastic protector that is very easy to peel off. There are 5 full nail images on this plate and 3 small bows. The images aren't very different from each other, which can be good or bad depending on what you wanna do with it. You can't create very different manicures with these images, but you can use different images on each nail and create a manicure with the same theme where every nail has a slightly different pattern. As usual, I had to test every image to see how it stamps. I used Konad Black for the swatches below. There were no issues with any of the images. They all stamp beautifully. I created a very simple manicure using the milky green glitter from the set I previously reviewed as a base. This polish is so colorful that it acts as a multicolored nail art base with a lovely result. I am kind of a neat freak and like my nails to be all the same, so I stamped the same image on each nail. You are welcome to use the different images and flip them around to create a different result on each nail. 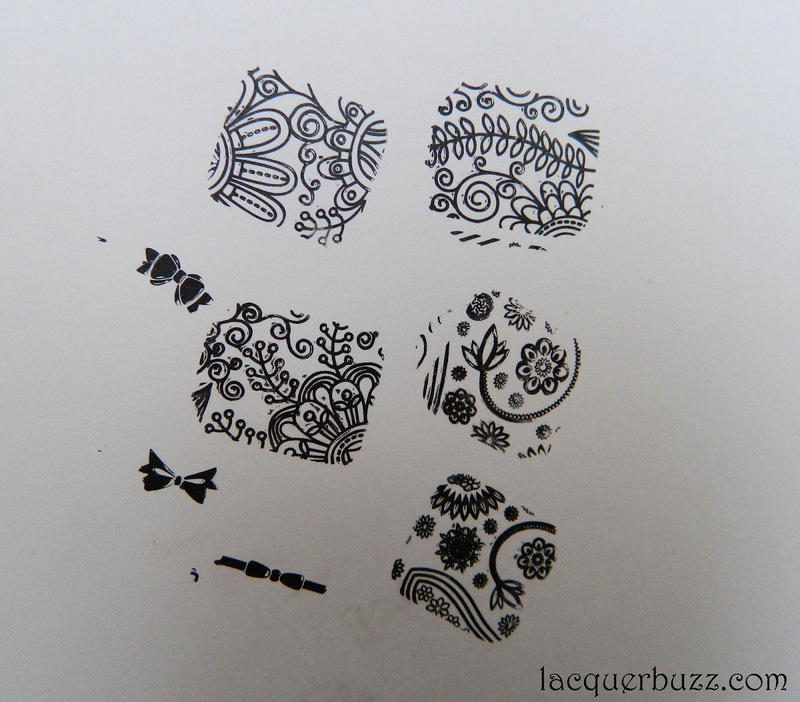 The patterns on this plate are also great for creating stamping decals. I love the plate selection the Born Pretty Store carries. There are lots of great ones at an affordable price. You can find this particular one here. Make sure you use code MFL91 at checkout to get 10% off your order. Hope you enjoyed this post. Thank you for stopping by! What a fun stamping plate! I've been loving stamping a lot recently but I'm not too good at it, lol. I think you will definitely get better in time. Stamping is so much fun! Ooooh these are such great images! I want that plate now! It's really nice. You should get it! Multumesc mult! Ma bucur foarte mult ca-ti plac, mai ales pentru ca mie mi s-au parut tare simple. Si da, recunosc ca-mi place sa am toate unghiile la fel. De-aia n-a prins la mine chestia cu skittlette. Accent nail mai fac cateodata da si ala trebuie sa fie asortat bine cu restul manichiurii. N-am mai postat demult pe grup si parca acuma nu-mi mai vine. Am vazut ca-i multa lume noua pe acolo. Nici n-am iesit din casa cu el. Mi-ar fi placut sa nu aiba pietrele alea acolo. Am analizat poza de pe site dupa care l-am ales si sa stii ca nu se vedeau bine pietrele. De-aia am fost surprinsa. Am 2 pentru ca una am luat-o ca backup. E destul de greu de gasit oja asta.